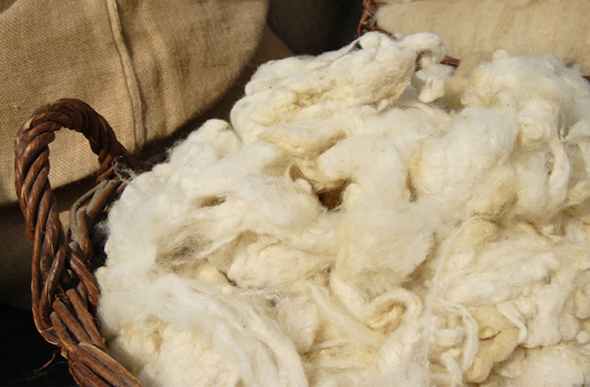 Pure wool is the oldest known textile. The wool allows the skin to breathe. The wool can absorb liquids more than 1/3 of its own weight, without a feel of humidity. The wool is not electrically charged, due to this reason absorbing dirt and unpleasant scent is minimal. The wool’s flexible structure is the reason why this material is wrinkle resistant. The wool regulates the body and bed temperature, despite of the surrounding environment. The wool is flame resistant. Dust mite does not inhabit natural wool (it is allergen and one of the most common causes of asthma decease and asthma attacks). The wool is biological and biodegradable material. The woolen products can be used up to 20 and above years. The quality of the wool relates to the age of the sheep – the best quality can be obtained of a sheep 2 years and above. The wool has a low diathermancy rate and in that sense could be used as an insulator. .
80% of woolen textile is actually pure air. 1 kg. of wool withholds approximately 150 gr. water. Basic rule for all products from pure wool is to wash in cold water and gently squeeze. Use delicate cycle and low-speed centrifugation and don’t forget to reduce the wash temperature to 30 degrees when you wash the blankets in washing machine. The wool usually shrinks because of the hot water, reduces its size and appearance of the blanket is ruined. You can use regular detergents for wool and fabric softeners. They will protect your blankets, refresh the natural wool, and keep it soft and delicate. It’s preferable to dry wool blankets outside in summer, but if it isn’t possible, you could hang them on a clothes drying rack, so as to hang freely, to dry slowly, and to keep their shape and size.. Since the wool blankets are usually not used continuously, it’s important to protect them from pests and moisture. Years ago naphthalene was used against moths, but this method is now outdated and carries with it unpleasant aroma, that permeates throughout the room. Today you can easily store blankets in tightly closed containers, bags and storage bags with an air suction valve. So you will not only prevent the fabric from moths, but also save space. You can also put in the bag some walnut leaves, 2-3 chestnuts or a bag with dried lavender. On the market there are numerous preparations to protect wool products from any kind of insect. All our blankets have an attached label, that indicates the type of fabric and how to care for them. For best results, always follow our recommended instructions.